Ready for a road trip? I’ll be spending the month of July in beautiful Geneva, New York with the Geneva Light Opera Company, appearing as Berta (and covering Rosina) in a production of Rossini’s The Barber of Seville. performed in English with chamber orchestra. Click here to buy them online. 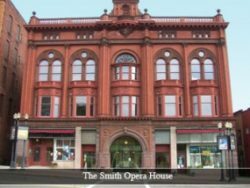 Perhaps you will use your visit to the Smith this month as an opportunity to scope out the venue and figure out where you want to sit when you come back for the Red Hot Chilli Pipers next spring! This entry was posted in Past Performances, Performances on April 3, 2018 by Alison.